Blue sharks are light-bodied with long pectoral fins. The top of the body is deep blue, lighter on the sides, and the underside is white. It grows to 3.8 meters (12.5 ft) long and can weigh up to 204 kilograms (450 lb). The highest reported weight was 391 kilograms (860 lb). 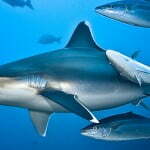 The blue shark is the most widely distributed animal in the world. 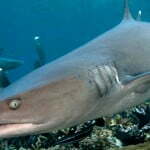 It is an oceanic and epipelagicshark found worldwide in deep temperate and tropical waters from the surface to about 350 meters. In temperate seas it may approach shore where it can be observed by divers, while in tropical waters it inhabits greater depths. It lives as far north as Norway and as far south as Chile. Blue sharks are found off the coasts of every continent, except Antarctica. Its greatest Pacificconcentrations occur between 20° and 50° North but with strong seasonal fluctuations. In the tropics it spreads evenly between 20° N and 20° S. It prefers waters with a temperature range of 7–16 °C (45–61 °F) but will tolerate temperatures of 21 °C (70 °F) or above. Records from the Atlantic show a regular clockwise migration within the prevailing currents. Squid are important prey for blue sharks, but their diet includes other invertebrates such as cuttlefishand pelagic octopuses, as well as lobster, shrimp, crab, a large number of bony fishes, small sharks, mammalian carrion and occasional sea birds. Whale and porpoise blubber and meat have been retrieved from the stomachs of captured specimens and they are known to take cod from trawl nets.Blue sharks rarely eat tuna. 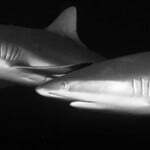 Adult blue sharks do not suffer predation on a regular basis, except by humans. 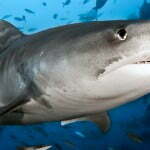 Young and smaller individuals may get eaten by any sufficiently larger sharks such as the Great White Shark and theTiger Shark . However, they are host to several species of parasites. For example, the blue shark is thedefinite host of the tetraphyllidean tapeworm, Pelichnibothrium speciosum (Prionacestus bipartitus). They become infected by eating intermediate hosts, probably Opah, (Lampris guttatus), and/orlongnose lancetfish, (Alepisaurus ferox).